Is the Labour Party going to become ‘Real’ Labour? Pictures so often speak louder than words. The graphs shown below (http://www.globalissues.org/article/39/a-primer-on-neoliberalism) illustrate one of the problems of defining left and right, which can be exploited by politicians, and in political debate, to befuddle the opposition. On the Authoritarian/Libertarian axis, Fascism is the opposite of Anarchism. On the Left/Right axis, Communism or collectivism is the opposite Neoliberalism or Libertarianism. The second graph indicates the position of some leaders of 2006. It can be observed that Tony Blair was more ‘left wing’ and ‘liberal’ than George Bush; and more ‘right wing’ and less ‘liberal’ than Angela Merkel. Nevertheless, all fall within the Authoritarian Right Wing quadrant. 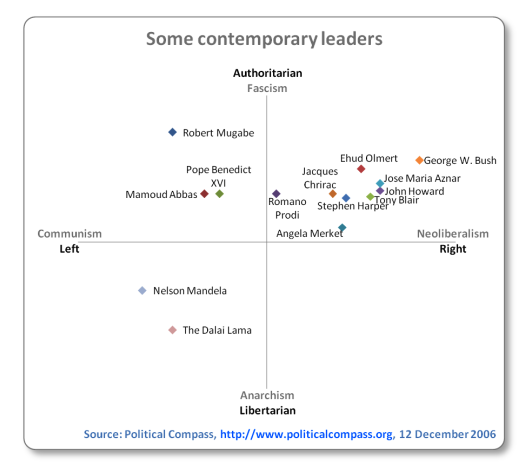 In contrast, the man voted the most admired global leader, Nelson Mandela, is firmly located in the Libertarian Left quadrant. 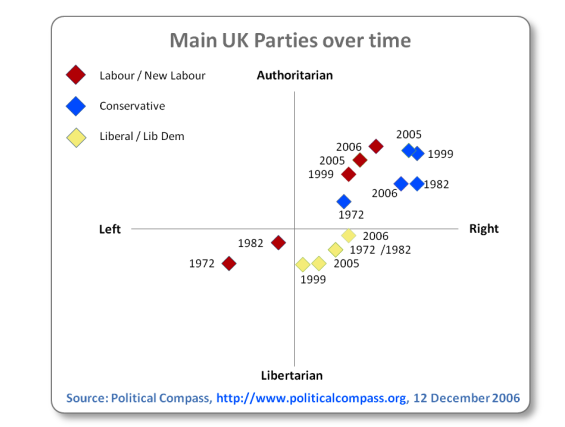 The third graph shows the mobility of the different UK political parties from the 1970s to 2006. 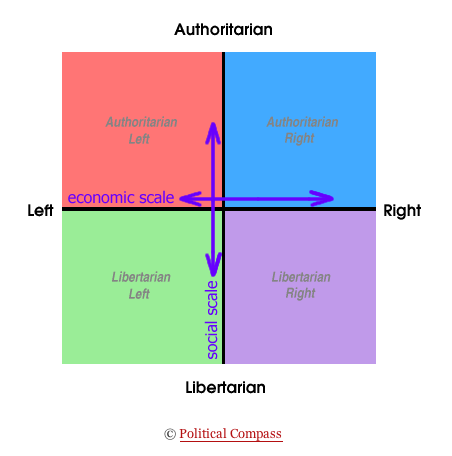 The most obvious feature is the steady movement of the Labour Party from the Libertarian Left quadrant to the Authoritarian Right quadrant. The Conservatives and the Liberal Democratics were much more consistent over the same time period. However, it seems likely that a more current appraisal would place the Osborne Tories, Nick Clegg and the Orange Bookers much further to the right, towards the Neoliberal end; although the Cameron Conservatives might also be considered less authoritarian. The position that has yet to be clarified is that of Ed Miliband’s Labour Party. Will he be persuaded by the Purple Book and former Blairites to keep the party within the Authoritarian Right quadrant? Will Blue Labour persuade him to move Labour further away from the Libertarian end, towards a more Authoritarian stance? Or will the Labour Party take up a position alongside Mandela and Ghandi, and become ‘Real’ Labour, once more standing up for real people and the global environment? This entry was posted in Opinion, Uncategorized and tagged Authoritarian, Collectivist, Ed Miliband, Libertarian, Neoliberal, Tony Blair by syzygysue. Bookmark the permalink. I am concerned that the Shadow Cabinet has been very quiet at critiquing Labour’s position. I want a left wing libertarian party to emerge. There have been some good signs and some less good signs Garry. The collapse of the global economy should be reason enough for a leftward move economically… and Ed Balls is a much safer pair of hands than Darling. A very real issue is the constant sabotage by the blairite rump. IMO they are in the minority but still hold significant positions of power within the PLP and amongst LP officials. We should not have to be fighting the democratic deficit within the LP when faced with the scorched earth and asset stripping policies of the coalition government. though the illustration of the distance and direction of travel of the Labour party looks even more appalling ‘on paper’. And I totally agree with your way of thinking in your comment beneath the article! On a technical note, there is perhaps a slight weakness in the wording in the OP. In the fourth paragraph, the term, Libertarianism, is used alongside the term, Neoliberalism, as if interchangeable. The map already has a Libertarian label at the end of the social axis, and equating Libertarianism with Neoliberalism could be confusing to readers. Thus, it may read better as : Communism or collectivism is the opposite of Neoliberalism or free market capitalism. (yeah, I know, in colloquial usage the term “Libertarian” usually means right wing libertarian).